Barney Loughlin, who died in early 2017 at 91 years of age, was a true American original. He grew up on Meadow Croft Estate, right in the middle of Sans Souci Lake Nature Preserve in Sayville. His property of 20 acres, including his 7-acre vineyard, was acquired from the Roosevelts after the war. After he left the army Barney first worked as a linotype operator for a small Sayville paper and then opened a print shop in town. However, he hated the work and was seeking an alternative. Having served in Europe he had learned about wine and liked it. So Barney became interested in what was going on in the North Fork with the vineyards an d wineries proliferating there. When he was told that wine grapes couldn’t be successfully grown near the South Shore of Long Island, he assumed the challenge (“it drove me nuts.”) and bought 1,800 vines which he, his wife Christine, and their three daughters planted by hand in 1984. To get to the tasting room one takes a long drive down a dirt lane that runs past the magnificent home of John E. Roosevelt–a nephew of Theodore–Meadow Croft Estate. Shortly after that there are a couple of very decrepit structures, which include a storage shed and the winery. Much further on (about a quarter of a mile, stands a shed that contains the tasting room. 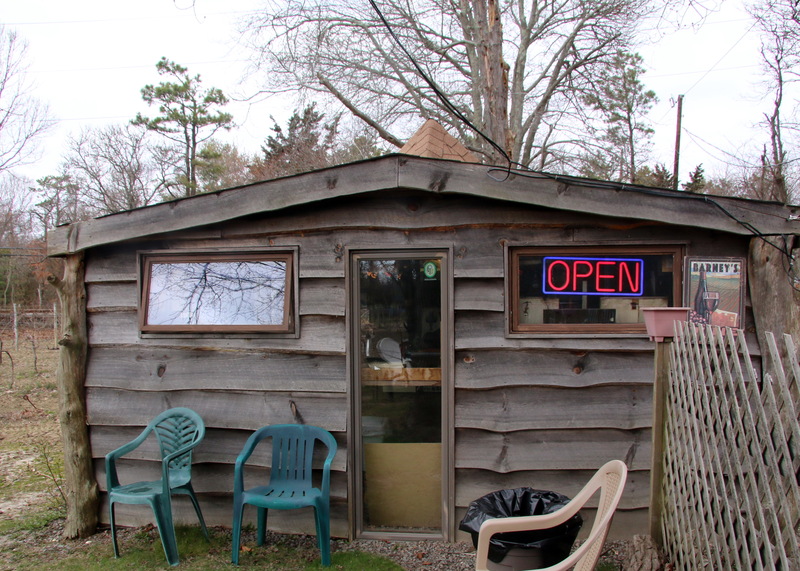 It’s a rough clapboard structure that announces itself with a neon OPEN sign. On the particular day that we visited (in March 2016) there was a nip in the air and the wood stove inside was roaring. Barney was seated with his back to the heat and in front a portable radio blared Country & Western. When we asked him questions we had to shout to be heard, for he didn’t turn the volume down. His eyes were weak, his hearing worse, and the day before he’d fallen off his tractor and walking was painful for him. The interview, such as it was, drew from Barney some profane reminiscences of his time as an U.S. Army infantryman in Italy, France, and Germany during World War II. He saw combat at Monte Cassino, which he described as “hell.” It turned out that Barney had myriad press clippings and photographs in an album that he’d had printed as a book. It covers the period from World War II to the present. His granddaughter, Brittany, pulled it out for our perusal, as can be seen in the photo above. One of the biggest problems facing Barney’s vineyards is the fact that it is surrounded by forest. Deer, bugs, and birds have ravenous appetites sated by eating his grapes. The crop loss can be significant. Hence, his output each year can vary considerably, not only because of the weather. 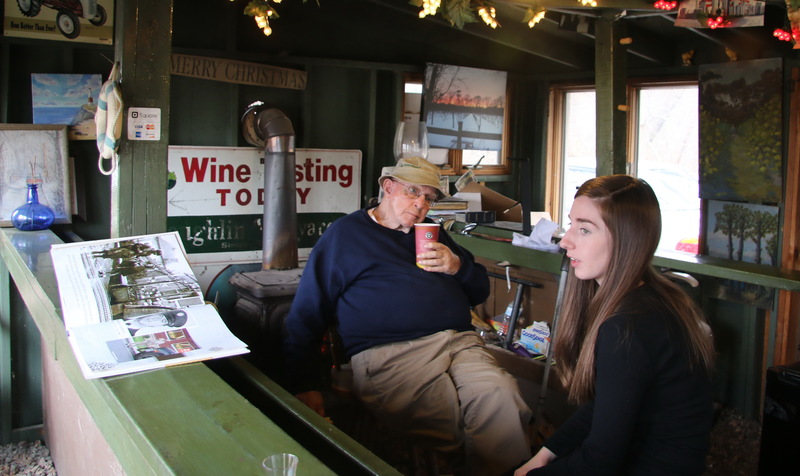 Originally his wines were made at Peconic Bay Winery by Ray Blum. 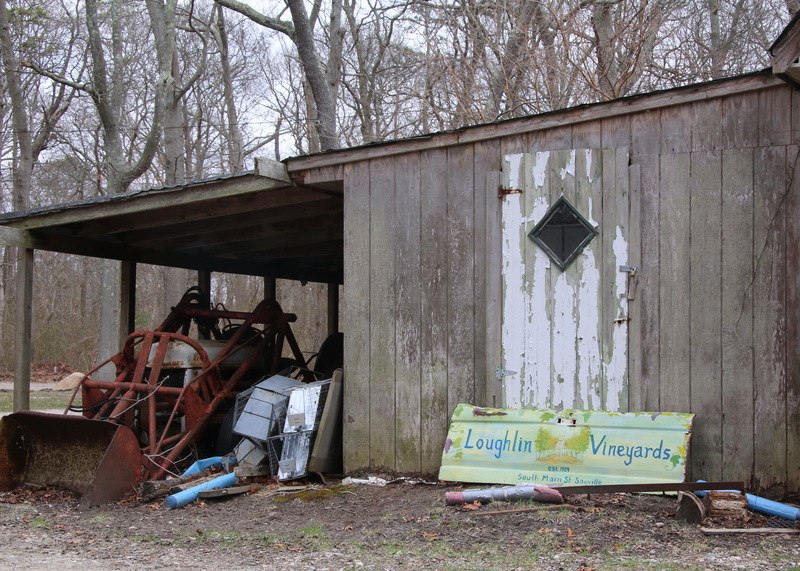 After the Lowerres purchased Peconic Bay they hired Greg Gove as winemaker, who then took over winemaking for Loughlin. As it turned out, Greg raised the quality level of Loughlin wines so much that Barney would accept whatever advice Greg gave him. In fact, Greg urged Barney to start a winery operation of his own, so with Greg’s guidance and advice he purchased grape-handling equipment, a bottling line, tanks and barrels, and by 2008 Greg was making the wines at his property (mis en boteilles au château). Since Barney’s death his daughters, Mary Ellen Loughlin, Beth Cutrone, and Patricia Jones, have decided to keep the business going. Patricia works in the vineyards, Greg now is a consultant, while Beth is the winemaker. Mary Ellen keeps the books. Brittany, who lives in the city, comes out every weekend to run the tasting room. But Barney’s irrepressible personality shall be deeply missed. They are also coming out with a rosé, called Pinky Rosé, as a homage to their old donkey (depicted on the label). Turn left and proceed down the dirt road bearing to the right of Meadow Croft Estate. This entry was posted in Vineyards, Viticulture, Wineries and tagged Barney Loughlin, Long Island wine, Long Island Wineries, Loughlin Vineyards on 24 October 2017 by JoseM-L.